Ahhhh we love a new version. Months and months of feedback from our clients which feeds the creativity and engages the mind. This turns into new features, improvements and fixes. Let’s get rolling with this latest release! 1 – Custom payment types at POS. Things like HiCaps, Cheque, Bitcoin etc can be used as payment types by clients. To access this feature head to your settings screen. Menu – Admin – System – Configure. 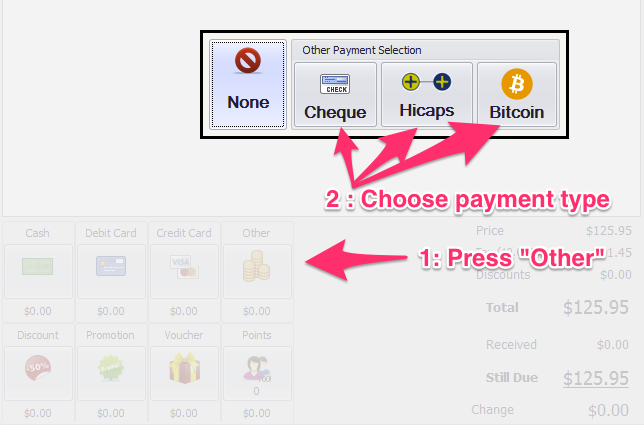 From there choose the Point of Sale tab and enable your payment buttons. Now when you’re at the POS taking a client’s bill you have the option to choose your new payment types. 2 – SMS conversation view now exists. Similar to your phone showing speech bubbles. Allows you to view complete client conversation history. You can click on a client and press S on your keyboard or simply check the new conversation tab in the client overview!. 3 – Referral Type editor now added so you can edit your referral types. Menu – Admin – Point of Sale – Referral Setup. 4 – New Report – Improved Non Return Client report with client info to contact them if required. 5 – New Report – Client Menu – Sales history Overview report. This shows a list of all transactions for that client. 6 – New Report – Client Menu – Detailed Transaction History report. Just like the normal Detailed Transaction History but just for that one client. 7 – New Report – Client Menu – Statement. Just like a bank statement. You can see the clients complete history and how their credit is holding up if you’re using the account feature. 8 – New Report – Financial Reports – Series Outstanding Report – To see which clients have series credits. 9 – General Appointments can now be recurring! You can have them recur as often as you require. 10 – Each employee can have custom notes that print on the receipt if they worked on the client. Great if you use HiCaps etc and need practitioner rebate info on the receipt. Maybe you also want a custom message based on the employee and their own personality. A great feature, be sure to check it out if you print receipts. 1 – Much improved SMS Confirmation auto reply logic. 2 – POS now doesn’t revert to Walk In as it did in the last version. It stays on the paying client’s name. This was confusing to many and we’ve taken it back to how it was. Thanks for the feedback. 3 – Product Order now shows price of order before tax, tax element and including tax. 4 – Product Import tool now forces non retail products to be not visible in POS. 5 – Improved privacy of Admin Code when restoring backups. 6 – Detailed Employee Performance Report now shows points used and made clients make more sense. 7 – Detailed Transaction History report had annoying bug where it showed last 2 days by default. Now fixed to 1 as it should have been. 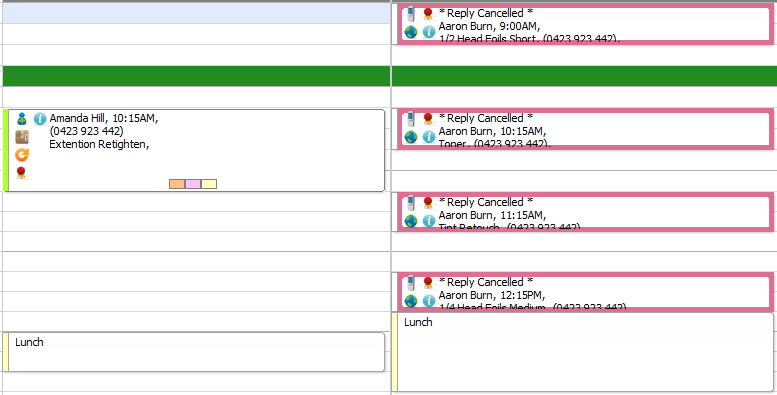 8 – Missing client info icon (blue) in appointment book refresh issue resolved. 9 – Product Adjustment tool now sorts according to name, not ID. 10 – Lists in Salon Swift now generally order themselves better, showing alphabetically rather than order they were entered. 11 – Send SMS Template tool improved dramatically to handle templates better and be visually easier to understand. 1 – Staff Time Sheet time display rather than hour display has been corrected. 2 – SMS view creation of a new template now saves over old one rather than duplicating. 3 – Manual SMS appointment confirmation could at times send wrong time. Now resolved. 4 – Auto Confirmation Settings screen update issue resolved. 6 – Recurring appointment bugs (there were a few little ones sorry) have all been resolved. 7 – Edit Client Account button in POS doesn’t show last value entered anymore. That was confusing sorry. It’s a big list and a lot to work through but it’s worth at least having a skim over and checking things that you think are relevant to you. New training documents and videos are coming on the new features so watch this space. If you’re not sure how something works for now though, just get in touch and we’ll guide you through it. Enjoy! Automated after care follow up. So you KNOW you should be following up clients after certain services. Things like Facial Peels, large Colour Changes, Eyelash Extensions and more. It would be GREAT if you could also remind clients before their appointment to do certain things, for example before a Spray Tan to remind them not to wear makeup or moisturiser. Well, have have you covered! Watch this new video on Automated After Care Follow Up and have Salon Swift do the follow up you should be doing, automatically.